Alan brings good news back from WoW's Battle for Azeroth beta. Now in its fourteenth year, Blizzard’s magnum opus MMORPG is about to get a seventh expansion. Called Battle for Azeroth, the expansion claims to be focussing on the newly refreshed war between the game’s two factions: The Horde and The Alliance. I say “claims” there because there’s plenty of speculation (and more than a few hints) that suggest that, like previous expansions, Battle for Azeroth will likely develop into something other than what is suggested on the box some time after launch. In this case, the rumor mongering suggests we’re going to be fighting old gods (like N’Zoth) before we’re ready for whatever the next expansion heralds. Battle for Azeroth does pretty much that most WoW (and generalist MMO) players expect of an expansion; it adds some new levels to the level cap, gives you some new quests and lands to adventure through, and spices up the combat loop by tweaking the way most of the characters play (to a greater or lesser extent). 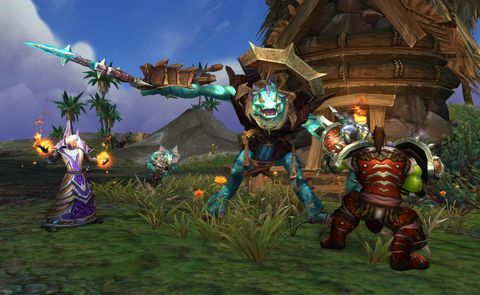 Most significantly, players will lose the “artifact” weapons they took possession of at the start of the last expansion, and then spent the entire rest of Legion leveling up and improving. Exactly what’s going to happen to it hasn’t been made clear yet (the latest version of the ongoing beta has yet to reveal the detail of that process), but players will once again be looking to get ever better weapons as the expansion progresses the old fashioned way – as drops from bosses in dungeons or raids. The artifact system isn’t gone in BfA; instead, it’s been replaced in the beta by a new neck slot item by the name of the Heart of Azeroth. Every character will have one of these and levelling it up will let you unlock advanced capabilities of other items you have (like your pair of shoulders, helm, or chest armor). This system should be an improvement over the existing AP grind for artifact weapons, thanks primarily to the fact that you don’t need a different one for each spec, but the kind of gear that’s accessible on the live beta server shows only simple attributes available to unlock. 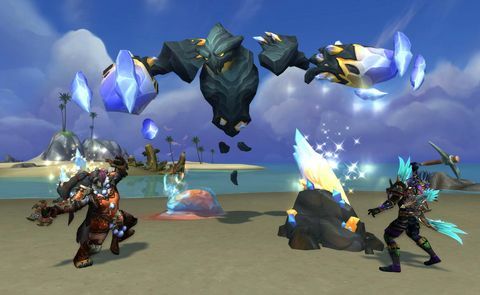 Game director Ion Hazzikostas has stated that more advanced gear from the game’s harder content should be expected to have the kinds of nifty unlockable abilities that you’d only get access to with serious advancement of your weapon in Legion or by securing one of the very rare legendary items that were available in that expansion, but no concrete examples have yet been seen. Legendaries, too, have largely (or perhaps entirely) been removed from the contemporary content. Largely derided by the most vocal of the community, the legendary system introduced in Legion led to gameplay patterns and gatekeeping within the player-lead aspects of the experience that weren’t intended by the game’s developers. It’s possible that legendary items might make a return but if they do, it’s unlikely to be in the Legion way where if you didn’t have certain items, your character was often gimped or might not be able to access certain tiers of content. The most obvious and easy thing to talk about, given the current nature of the beta servers, is the levelling content. Players are introduced to a robust new tier of inter-faction fighting by way of start-of-expansion scenarios, in which the Horde and Alliance get real angsty over exactly who is allowed on which of Azeroth’s continents. 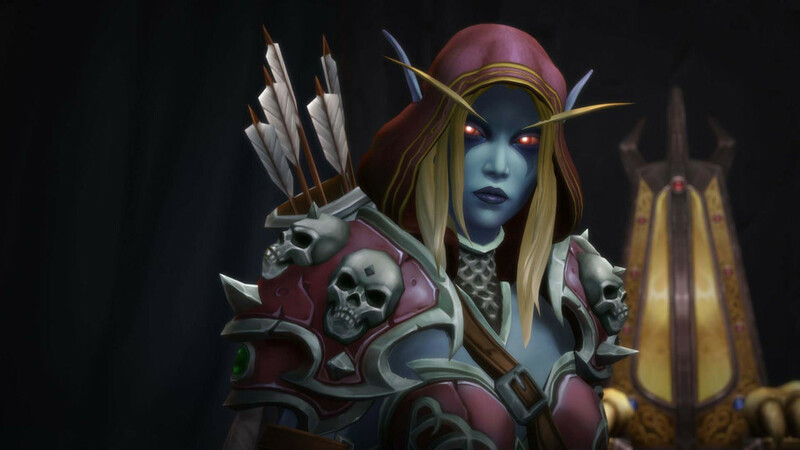 Specifically, Sylvanas Windrunner – now Horde Warchief – seems to have a bee in her bonnet about something (a pre-expansion novel by series regular Christie Golden will make most of the details clear, but good luck buying it in New Zealand if you prefer ebooks), and she’s using whatever that is as an excuse to burn down the world tree Teldrassil. Yes, that’s right; that place you levelled up your first Night Elf character is goneburger at the start of the expansion. Gulp. There’s loads of other narrative stuff in here (I’m not going to ruin all of it for you), much of which suggests Sylvanas is the boring black-and-white kind of evil, but Christie Golden – who now works for Blizzard and drives the game’s narrative – intends to have a few twists hidden here and there (very well hidden if you like ebooks and live in New Zealand, grumble grumble…) so it seems likely that something… deeper… is going on. We shall see. The game’s wider narrative all centers around this stuff called Azerite, which was discovered at the end of Legion and is actually the crystallized blood of the soul of the planet Azeroth itself. This powerful glowing stuff seems to be the meta-currency much of the new game is built around, with players performing all sorts of activities in order to obtain it for their faction. One of the new ways players can engage with the game is via a mechanic called Island Expeditions. A competitive but PvE mode, teams will compete with each other to collect a certain amount of resources from randomly generated islands before the other in order to “win” the scenario. The most interesting twist in this new mode is that the enemy team – made up of members of the opposite faction – is actually entirely AI. Blizzard claims that this AI is the most realistic they’ve ever made, and that they should do some smart, player-like things rather than just being the simple “mobs” that make up the rest of the non-player character content in the game. I can’t tell you if any of this is true, however, as I haven’t unlocked access to the mode yet (sadface), but legendary WoW video creator Bellular has a detailed clip on the mode here (he loves it). Another brand new way to play is the Warfront mode. Announced at BlizzCon but not really understood until it first appeared on the test servers last month, Warfronts are a mode for up to 20 players that play out quite a lot like an RTS come MOBA, albeit on an altogether far grander scale. Players need to work together to build their base (like in the Warcraft RTS games) which increases the strength, capability, and frequency of the NPC units that base creates and sends to attack your enemy. Juggling attention between defense, offence, and resource gathering type activities are suggested to be critical in winning each match. 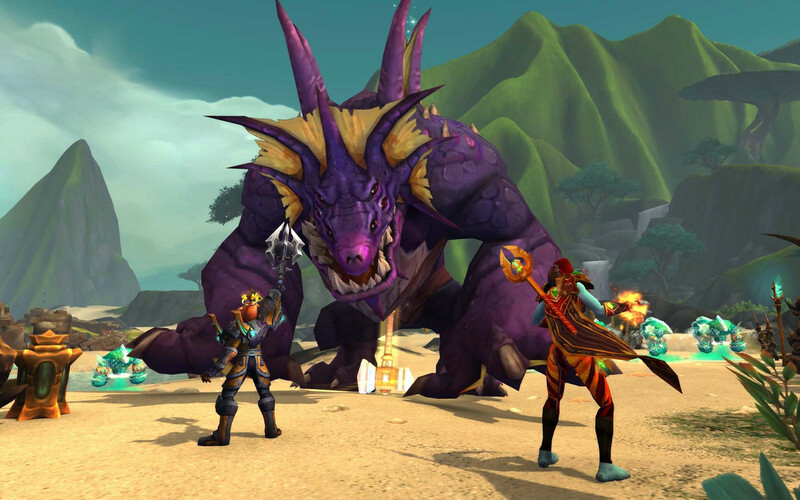 Interestingly, despite the war-heavy premise, Warfront is – like Island Expeditions – a purely PvE experience, with enemies entirely controlled by AI. I haven’t played this either, but that’s because it’s not currently available to test and hasn’t been available very much since the first three hour test back in April (Bellular - the ultra prolific video-creating legend that he is – recorded his experience of that test). As a fan of the RTS games and one who patiently awaits the announcement of Warcraft IV at BlizzCon this year (I can dream), I’m definitely very interested in seeing how this RTS-MOBA hybrid plays out once it’s widely available. 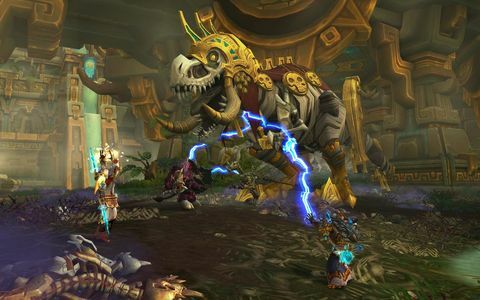 There’s loads of other stuff to talk about, obviously, as this expansion is supposed to keep us busy for 18 months or so, and Blizzard has made plenty of changes to all sorts of systems that would take many articles to dissect in detail. There are, for example, significant revamps of profession systems, brand new continents chock full of interesting detail, and fundamental changes to the global cooldown system, the way loot works, and so much more. But I’ve already written too many words so I’m going to save some of that for the review (or leave it for you to discover for yourself, or for Bellular to detail in one of his thousands of videos). Instead of going on about that stuff, then, I’d like to close by stating that, while clearly unfinished, the content on the beta server strongly suggests this expansion that will buck the usual trend of good-bad-good-bad that the series has previously been accused of. 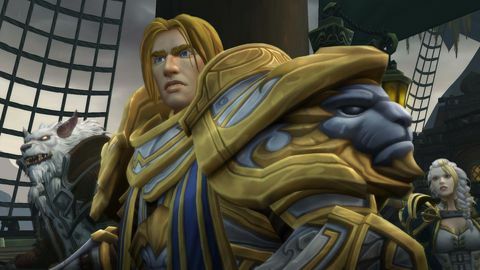 While Legion was fantastic and brought about a renaissance in the game, BfA looks to learn from that expansion, leveraging stuff that made it good while accepting that some of the aspects (like legendaries) ultimately didn’t work as well as anticipated. Playing through the new content is fun, the new modes are meaningful, and Ion’s team is clearly hitting its stride with an ability to deliver strong content on a regular cadence. I’m extremely optimistic, basically, and can’t wait to get my teeth stuck into the real thing when it launches on August 14.